I did three art pieces today. All three are watercolors and one is an ACEO sized (2.5 x 3.5 inches) of yet another cat for the Cat Advent Calendar series that is going on until the 24th. Today’s cat brings you a MOLE. The last one is about feeling lonely in a crowd. You can see them all and more original paintings on eBay at 3amGallery store. He loves to hide in sunflowers. This fun little painting is done in acrylics on a vintage found board (I found a small bag of cut boards in the attic) and sealed under varnish. He’s small, just 4.5-inches by 2.5.inches. I was owned by a large white cat once upon a time and he wasn’t really big on the outdoors but he loved to walk in the garden with me and sniff the flowers. Especially roses. And the valerian, which if you haven’t had the pleasure, smells a lot like a foot. He really liked valerian. This is part of the Cats of May series and is 3.5 x 5.5 inches vintage postcard from the early 1900s. This acrylic piece is 3.5 x 5.5 inches painted on a vintage postcard. The Cats of May is a series of cat paintings I am doing in May 2016 – one cat per day to remember great cats I’ve been owned by and the cats of friends. 🙂 I hope you enjoy it. 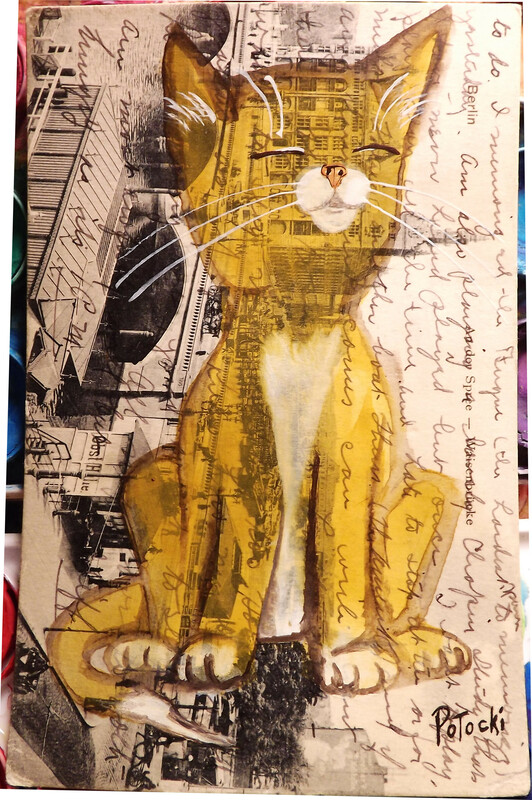 I wanted to paint a Cheshire-like cat – except this one is on a postcard about Hamburg. There was a tiny bend in the top left corner – I painted over it and taped the back (it’s about half an inch) and it’s feeling sturdy now. It doesn’t show in the finished piece. I had a little kitten once, and he used to crack me up. He’d play and play and PLAY as kittens do, then he’d be just sitting there trying to decide what else to get into and he’d just fall asleep sitting there for a while. Usually he fell over one way or the other. 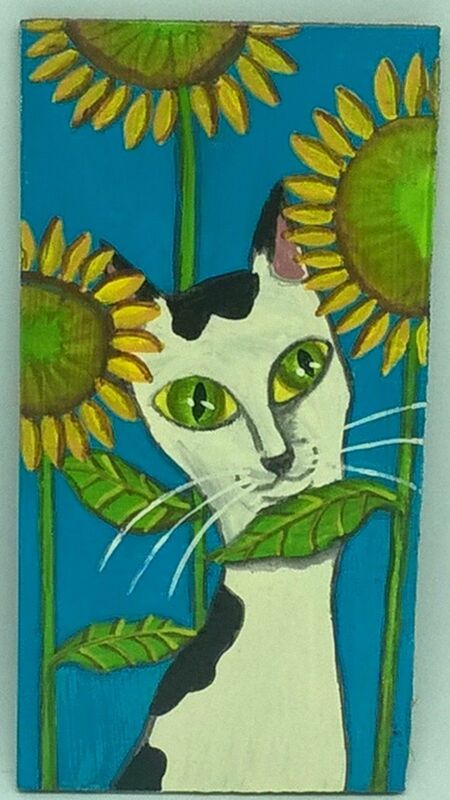 If you’d like a cat painting of your own – just contact me for a commission!